Welcome to the installation guide for FX AlgoTrader products which use a JavaFX interface. Make sure you have a zip utlity installed so you can access the zipped installer package. We recommend 7Zip which is free! Also make sure you have Java installed on your machine and it is up to date. You can download java here. It is also free! (Use the MT4 'Open Data Folder' [Click 'File' and then 'Open Data Folder' in MT4] option to very quickly identify the MT4 Data Folder location, you'll see the path to the folder at the top of the explorer window... if you right click on the path information in Windows Explorer you can select "copy address as text" from the dropdown selection.. then you can simply paste the MT4 Data Folder into the installer text field by clicking in the installation text field and pressing Control & V (to paste the data)). Do NOT use the same MT4 Data Folder as shown in the installation guide. Each trader's MT4 Data Folder will be different! Do NOT install the package in the MT4 indicators or experts folders! VERY IMPORTANT: If you get Windows UAC prompts during the installation process make sure you ALLOW the installer to make changes on your computer otherwise the installation won't work. In MT4 - Right click in the Navigator window (Press Control + N to display the MT4 navigator) and select 'Refresh'. You will see a red notification on your chart saying "JFX Interface not loaded". To load the interface open the MT4 Data Folder and double click the file called 'FXA_JFX_Interface.jar'. The interface will prompt you to enter the path to the MT4 Data Folder (1st run only). The system uses the installation folder as the default MT4 Data Path. If this is correct click 'Done'. How do you configure Email Alerts in the JFX interface? 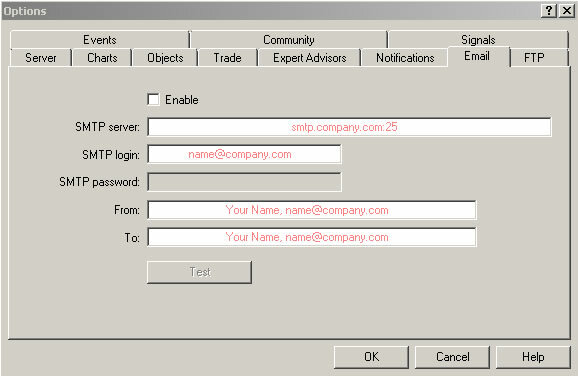 To enable Email alerts the trader needs to configure the MT4 Email options. These can be accessed in MT4 by clicking 'Tools' / 'Options' then select the 'Email' Tab. Now fill out your email service provider SMTP data according to the form below. Once the MT4 Email options are configured any JFX product with the Email tab checked will send emails to the designated account accordingly. How many MT4 accounts can I use the JFX products on? There is no license restriction on the number of accounts. The only restriction is you can only log into the JFX system twice concurrently (at the same time). You can control multiple MT4 accounts running on the same computer from a single instance of the JFX interface. To control a different MT4 account simply change the MT4 Data Path in the interface. Swapping between accounts takes just seconds! How many charts and timeframes can I use the JFX products on? You can run the JFX products on as many charts and timeframes as you like. There are no restrictions. How do I enable 'Allow DLL imports'? 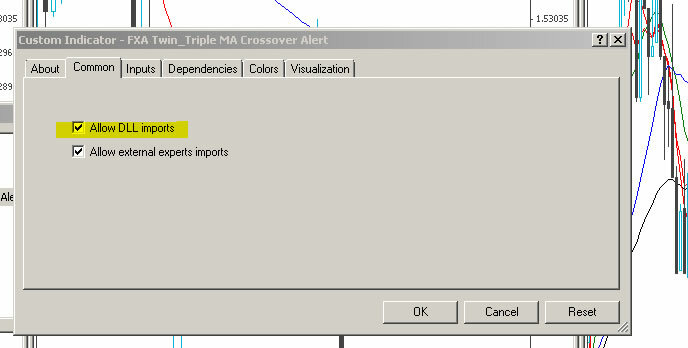 'Allow DLL imports' is a tick box option in the common tab for all MT4 indicators and Expert Advisors. When you load a product you will be presented with a small interface.... to access 'Allow DLL imports' click the common tab and select the option in the tick boxes as shown in the screenshot below. If you want to always allow DLL imports make a global change in the MT4 option menu. 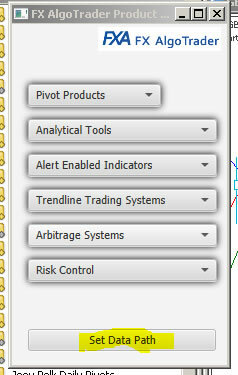 To do so - in MT4 click 'Tools' / 'Options' and then select the 'Expert Advisors' tab. Now make sure 'Allow DLL imports' is ticked as shown below. This will always ensure "Allow DLL imports" is selected on product load. All the JFX products use control files which hold parameter data for the underlying MT4 charts. The beauty of this approach is specific parameter files can be set up for each timeframe thus allowing traders to create unique set ups for each timeframe for an asset. Standard MT4 templates are not specific to timeframes but rather ALL timeframes for the asset in question. If you try to use MT4 templates to hold JFX parameter data all that will happen is the template will load the JFX Indicator/EA which will then search for the underlying control file in the MT4 files folder. If no parameter file is found for the specific timeframe the JFX indicator/EA will use the default parameter settings for the JFX product. How do I remove the 'No JFX Interface Loaded" text in the chart main window? 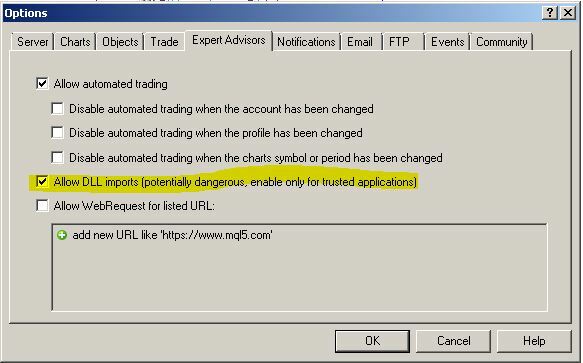 Ensure you have enabled "Allow DLL imports" when you load the FX AlgoTrader indicator or EA. Then log into the Java interface and then simply change the chart timeframe to remove the no interface loaded notification. Sometimes the Java file associations get messed up on your machine. The most obvious sign you have a problem with file associations is where you double click the Java Interface for the first time and Windows thinks the MT4 Data Folder is a 'Windows/System 32' file. The easiest way to resolve this issue is to run a utility program called JarFix this was developed by Johann N. Löfflmann and you can view the details of his utlity here. You may also see the error message in the screenshot above which indicates your Java file associations aren't correct on your machine. Jarfix will resolve these issues. Once you've run Jarfix simply re-load the Java interface by double clicking on the 'FXA_JFX_Interface.jar' file in your MT4 Data Folder. How do I set the Data Path? The Java Interface needs to know where the MT4 Data Folder resides on your machine in order to communicate with MT4. When the JFX system is initially run the system will automatically prompt the trader for the MT4 Data Path. To set/check or modify the MT4 Data path click "Set Data Path" as shown below in the screenshot of the product catalogue. When I make changes to the Java Interface nothing happens on the MT4 chart! Assuming you have correct synchronisation between MT4 and the Java interface, when you click in the main chart area on any chart running FX AlgoTrader Java JFX tools the "Selected Chart" field in the interface will show the current chart Symbol and ID which will match the chart ID at the top left corner of the MT4 main chart window. I can't see any indicators in my custom indicator folder? There's nothing there! Make sure you pointed the installer at the MT4 Data Folder... also make sure MT4 was closed when you ran the installer. If you ran the installer with MT4 open - just close it and re-open it. If you're installation target was correct the indicators/ea's will now be visible. The AppData folder is a hidden folder so if you can't see it in Windows Explorer you will need to change your Folder Options in Windows... Here's a video of how to do this if you want to navigate to it. Why aren't the Java interfaces displaying like the ones in the demo videos? When the Java interfaces are initially loaded they use a default size which depending on your screen resolution may clip some of the interface components. You can resize all of the Java interface windows by dragging the borders of the window in the conventional windows resizing fashion (see video). When the interface is closed the settings you have made will be saved and when you re-open the same inteface the system will load your previous window position and size. How do I enable alert sounds with JFX tools? All JFX products can play .wav sound files which can be located anywhere on the machine which the user has access rights for. The default MT4 sounds are held in a folder called "Sounds" which resides below the MT4 Data Folder. 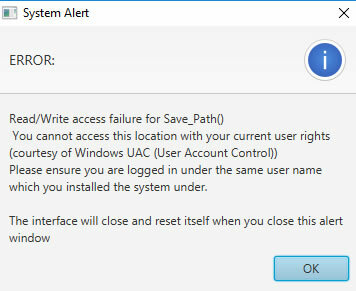 If you are running on a machine with Windows UAC (User Account Control) enabled Windows will have virtualized your MT4 Data Folder and the sounds folder won't be accesible from the virtualized location. How do I change the Selected Chart in the Java interface?